What are reps and sets? This post explains all you need to know about reps, sets, rep ranges and rest between sets, so that you can improve your training results. Anyone that is learning how to lift weights will come across these two terms quite frequently. 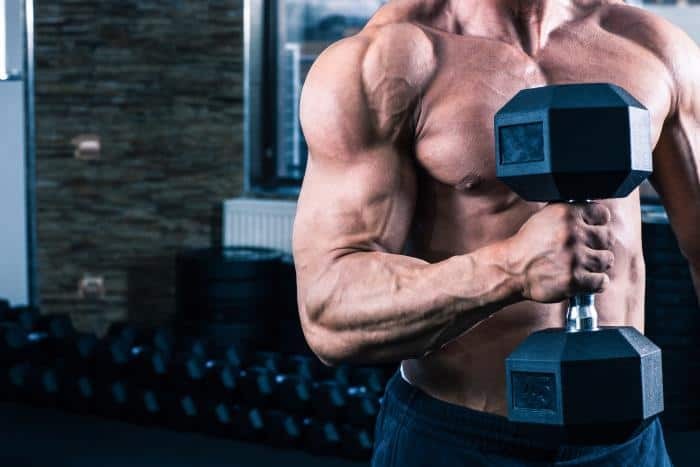 Whether your interest is in bodybuilding, powerlifting, physical conditioning or a combination of all three, your weight lifting routine will require you to perform the proper reps and sets based on your needs and goals. By having a clear understanding of what they are, you will attain far greater results with your workout sessions. What Are Reps and Sets? Reps (short for repetitions) refer to the number of times you perform a particular weight lifting exercise. If you were to perform a single motion of the bench press (i.e. lowering it to your chest, then pressing it back up), that would be one rep. If you were to do that same motion 5 times in a row, that would be 5 reps.
Sets refer to a sequential collection of a predetermined number of reps. So if we do 5 reps in a row, stop for a couple minutes, then do another five reps, that is 2 sets of 5 reps. The amount of rest between sets depends on the intensity (e.g. heaviness, or difficulty) and number of reps you complete in a given set. I discuss rest between sets in detail, later. Strength training entails lifting heavy loads for low reps. Specifically, the 1-5 rep range is best for gaining strength. Powerlifters tend to lift predominately in the 1-3 rep range (i.e. heavy singles, doubles and triples) for their main lifts. Hypertrophy training, or training to build muscle, entails lifting moderate loads for moderate reps. Often, 8-12 reps is cited as the best rep range for hypertrophy. However, I contest that the 6-15 rep range is more inclusive and accurate. Endurance training entails lifting light loads for high reps. Specifically, doing more than 15 reps per set trains muscular endurance. Doing such high repetitions places trains the muscle fibers that are resistant to fatigue under stress. In other words, you get better at doing more reps of a certain weight, as opposed to getting better at lifting a heavier weight within a lower rep range. Hypothetical scenario: If I had to just one rep count that I could do on every set of every exercise for the rest of my life, I’d choose 6 reps. I’ve found that 6 reps is the best compromise between strength and muscle building goals. Thankfully, I don’t have to make this choice. My point in using this silly hypothetical scenario is to show that these three goal-related rep ranges are on a continuum. That is, they overlap. Heavy sets of 3 reps will focus on building strength, but it will also build some muscle, and endurance to a much lesser extent. And while sets of 20 reps will focus on building endurance, it will also build some muscle, and strength to a much lesser extent. The lesson in all of this? You can and should utilize all the different rep ranges to your advantage. You should focus on one rep range at a time. However, in order to get the best results over the long run, you need to periodically shift your focus (this is the basis for periodization). Two to four minutes of rest between sets is recommended for strength training. One to two minutes of rest between sets is recommended for hypertrophy training. Thirty seconds to one minute of rest between sets is recommended for endurance training. Of course, the above are general recommendations. You may need a little more or less on some exercises and sets. The best way to gauge rest time is to begin a new set as soon as you feel recovered to the point where you can physically put enough energy into to productively execute the next set. For example, if you go from doing 6 reps for the first set to doing 2 or 3 reps for second set, then you probably need more rest between sets. The number of reps and sets in your workouts should take intensity, volume and frequency into consideration. Intensity (or load intensity) technically refers to the percentage of your one-rep max weight used on a set for any given exercise. Practically, though, you can think of intensity as the weight’s “heaviness” (i.e. how heavy it feels, not the actual weight in lbs). High intensity workouts always involve low reps, and usually involve relatively few sets. Low intensity routines are the opposite. Volume refers to the total work (reps x sets) done in a particular workout session. High volume routines typically involve moderate to high reps and more sets per workout. Low volume routines are the opposite. Frequency refers to how often you train a particular muscle group or exercise, per week. A high frequency routine can have lower reps and fewer sets and per workout if it involves mostly high intensity training; or it can have higher reps and more sets if the intensity is moderate to low. Low frequency routines are the opposite. So how many sets should I do for strength, hypertrophy and endurance?